A Turkish court on Friday convicted an American pastor of terror links but released him from house arrest and allowed him to leave the country, removing a major irritant in fraught ties between two NATO allies that still disagree on a host of other issues. Hours later, Brunson was transported to Izmir’s airport and was flown out of Turkey, where he had lived for two decades. He was expected to be flown to the U.S. military hospital in Landstuhl, Germany. “I love Jesus. I love Turkey,” an emotional Brunson, who had maintained he was innocent of all charges, told the court during Friday’s hearing. He tearfully hugged his wife Norine Lyn as he awaited the court decision. 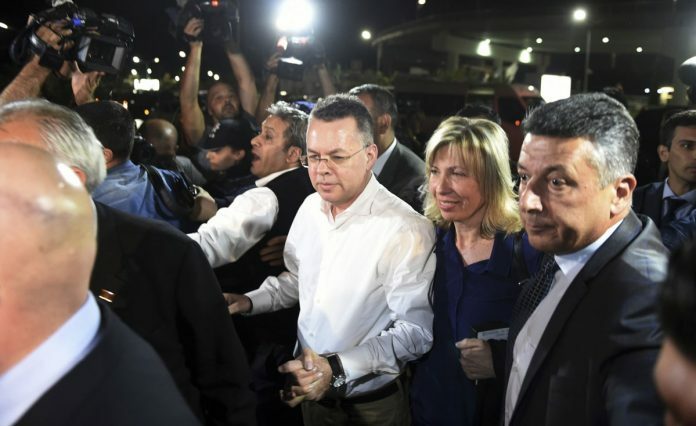 “PASTOR BRUNSON JUST RELEASED. WILL BE HOME SOON!” U.S. President Donald Trump tweeted after the American was driven out of a Turkish prison in a convoy. The release of Brunson, 50, was a diplomatic triumph for Trump, who is counting on the support of evangelical Christians for Republican candidates ahead of congressional elections in November. Friday’s ruling followed witness testimony that seemed to partly undermine the prosecutor’s allegations and highlighted concerns that Turkey had been using the U.S. citizen as diplomatic leverage. Turkey bristled at suggestions that its judicial system is a foreign policy instrument, and has accused the U.S. of trying to bend Turkish courts to its will with tariffs in August that helped to send the Turkish currency into freefall. Brunson’s release doesn’t resolve disagreements over U.S. support for Kurdish fighters in Syria, as well as a plan by Turkey to buy Russian missiles. Turkey is also frustrated by the refusal of the U.S. to extradite Fethullah Gulen, a Pennsylvania-based Muslim cleric accused by Turkey of engineering a 2016 coup attempt. Earlier, the court called two witnesses following tips from witness Levent Kalkan, who at the previous hearing had accused Brunson of aiding terror groups. The new witnesses did not confirm Kalkan’s accusations. Another witness for the prosecution said she did not know Brunson. “We helped everyone, Kurds, Arabs, without showing any discrimination,” he said. Turkish President Recep Tayyip Erdogan had resisted U.S. demands for Brunson’s release, insisting that the courts are independent. But he had previously suggested a possible swap involving Brunson and Gulen, who denied he organized the coup attempt. Other witnesses had not yet testified in Brunson’s case and evidence was still not complete, suggesting a rushed effort to resolve the case. While supporters in the United States celebrated Brunson’s release, his case overshadowed the predicament of a Turkish-American scientist from NASA and several Turkish workers for the U.S. diplomatic mission who were arrested in Turkey.